Classic Southern pimento cheese spread made with cheddar cheese, pimentos, mayo and spices. I must have been hungry when I went shopping for groceries this week. I spent about $150 more than I usually do AND I decided I needed to buy two pounds of cheddar cheese. And at least 40’leven different types of fresh fruit. And enough canned beans to get through a nuclear winter. I got home and looked at that mammoth-sized block of cheese and thought well, now what are you going to do with that? So I did what any good Southerner would do. I made pimento cheese. If you’re not familiar with pimento cheese (sometimes called pimento cheese spread), we usually make sandwiches with it. On white bread. Or we eat it on crackers or celery sticks. And if we’re really lucky, we have some around when we’re grilling burgers because a pimento cheese cheeseburger is just about one of my favorite things on the planet to eat. The cheese gets all melty and ooey and creamy and gooey and it’s… well… it’s just ah. maze. ing. Shred cheese* then add to a large mixing bowl; set aside. Combine mayonnaise, salt, cayenne pepper, white pepper, onion powder and garlic then mix well. Add mayo mixture and drained pimentos to shredded cheese and stir until all ingredients are thoroughly incorporated. Add more mayo if desired. Refrigerate until ready to serve. *I usually use medium cheddar but if you prefer sharp, rock it out :) I've also used half swiss and half cheddar and absolutely love the combination. Do NOT use pre-shredded cheese to make pimento cheese. Just trust me on this. This is how I make it minus the salt. I try to use extra sharp cheddar and I mix by hand. Man, now I want a grilled pimento cheese sandwich and a bowl of tomato soup. if this is anything similar to DiPrato's 'minner cheese, i'm all over it! I gave your recipe to my hubby as he is learning to cook and experimenting with Pimento Cheese. Or, we eat it on tortilla chips which is what I've been doing lately for some crazy reason. Hey... at least they were multigrain chips LOL! I agree with you on shredding your own too - just makes a difference. Nice recipe Mandy! Great using corn chips to dip too! Yum! True pimiento cheese has only cheese, pimientos, mayo and a little sugar(teaspoon or so) and hot sauce. Balance the sweetness with the hot sauce(I prefer Texas Pete). I have made this before and sometimes add a tiny bid of horseradish. Love it on burgers! I make mine with white and sharp cheddar, some tabasco and like the poster above, add a tiny bit of horseradish. The most delish burger I ever put into my mouth was in a little country restaurant in Virginia several years back. It was a pimento cheese burger with fried onions on top and I have been a junkie for them ever since. 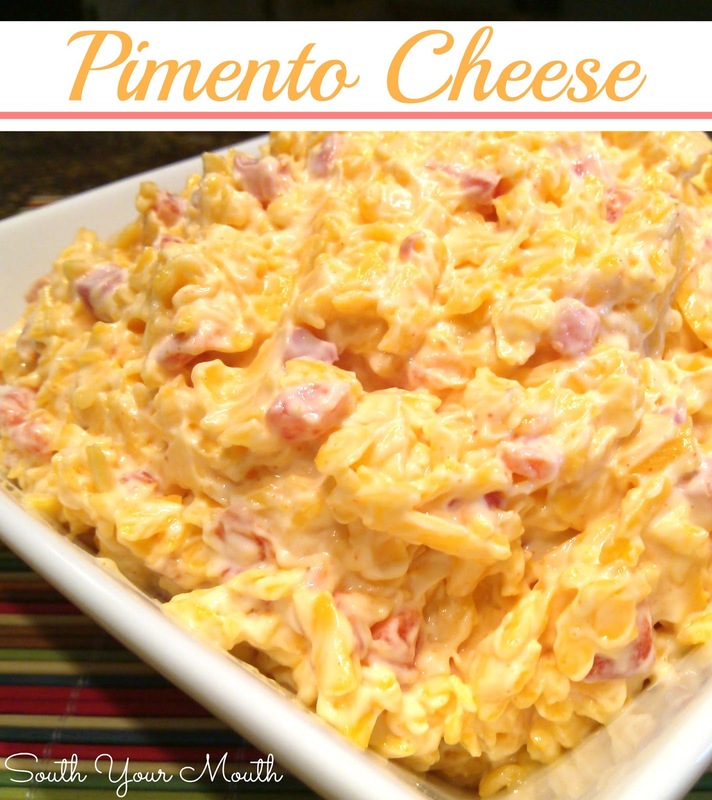 My go to recipe for pimento cheese! Soo good! I add a little sugar and sweet chow chow relish to mine.... Love all your recipes! !